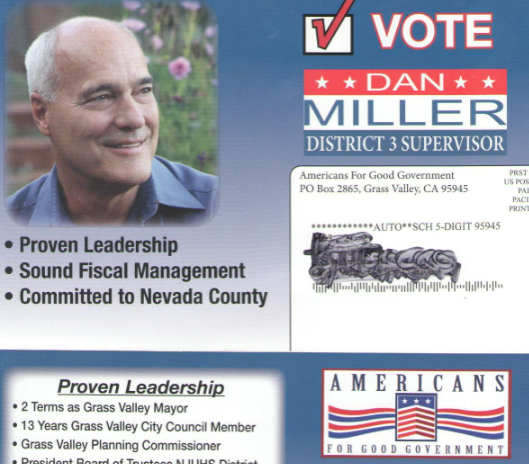 More PAC money is infiltrating local races — this time the newly created PAC called “Americans for Good Government,” managed by Tea Party members, paid $2,222.37 for District 3 Supervisor candidate Dan Miller’s first campaign mailer, according to documents filed with the County Elections Office. The PAC’s contributors include Stan Meckler, father of Tea Party co-founder Mark Meckler. The expenses list “mailer in support” for Miller, now Grass Valley’s mayor, according to the Form 496 dated March 25. The mailer has begun arriving in mailboxes (and I managed to find one). I recently wrote that the local tea party faithful was rallying around Miller’s campaign, and I guess I wasn’t “a woofin’.” From over in Penn Valley, Tea Party supporter and attorney Barry Pruett (whose wife works for Congressman Tom McClintock) also has contributed to Miller’s campaign. The hard right and tea party are putting their chips behind Dan, a staunch conservative. He is trying to unseat incumbent Terry Lamphier. At stake is a shift toward a decidedly more conservative BOS if Miller wins. Lamphier has done a good job and is admired for being a listener. He and District 4 Supervisor Hank Weston traded professional compliments at the candidate’s forum this week. But Lamphier finds himself on the opposite end of some rigid hard-right ideologues, activists, staunchly conservative old timers — and now, Meckler and the tea party. Former District Supervisor John Spencer and his wife, Patti Ingram, are vociferously supporting Miller. Spencer was unseated by Lamphier four years ago in his attempt to win a third term. Freedle, highly active in hard-right politics, also is a former supervisor who lost to Bruce Conklin in a bitter campaign in 1998. It dredges up memories of when progressives led the County BOS and were referred to as the “Gang of Four” by the conservatives. One local joked that the Miller-Lamphier campaign is a political “revenge campaign” for Freedle, Spencer and others. I’ve been feeling heat just for writing about this race (the Pruett and Todd Juvinall blogs have gone on the rampage), including my write-ups on the “It’s Miller Time” campaign signs that hang over the Greater Grass Valley Chamber of Commerce building. The Union followed up on this issue, crediting Sierra Foothills Report. It’s time to dredge out the asbestos underwear. Full disclosure: I’m in the hole $1.60 for dredging up these latest campaign reports. Isn’t it about time for the Tea Party to come out of the closet and admit that it’s a political organization? I’m a Democrat, Chair of the Nevada County Democrats, and proud to announce it to the world. There’s no shame in admitting who and what you are. It continues to amaze me that many of my “progressive” and “conservative” neighbors want to avoid labels like Democrat or Republican, or Green or Libertarian. Yet, when and if they do look in a mirror they could find they have much in common with one political party or another. Nevada County is a “purple” county. We have issues we agree upon and those where we disagree. That’s our right and obligation as Americans. It’s not divisive to disagree. It’s educational. Thank goodness we have a free and open availability to share opinions and views, even when we disagree. The challenge is to accept that our system works when we all participate in the dialogue, and act in a positive way on our convictions. I was thinking the same thing about the TP. Just admit you are a arm of the Republican Party. 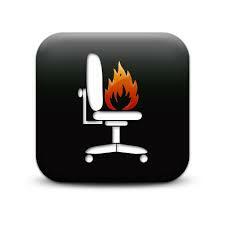 MoveOn has developed into the same thing for the Democratic Party. I like MoveOn they are truly about grassroots democracy that uses small donations from millions of people to fund their PAC’s. I agree with their issues for the most part and have co-hosted a couple house parties organized by the organization. The TP is not bad in what they do, they are bad in the fact they are hypocritical to their mission statement and non profit status. Thanks for the good work in political reporting, especially as the 2014 election cycle heats up locally. as well as beyond our county or district lines in Congressional and CA Legislature races. If there was a NEVADA COUNTY PULITZER AWARD your reporting would snag you one, hands down. Hold the appropriate feet to the fire. Me thinks your reporting getting Tea Party and Far Right Republicans spitting fire on their blogs is the best way to measure how good your reporting is. During the Pruett/Diaz era elections the local TP received a $10,000 “grant” from an anonymous funding source for a “nonpartisan” effort “get out the vote.” All very legal according to TP records with most of the money spent for radio ads on KNCO and prints ads in The Union. During the 2012 election cycle, Koch brothers affiliated organizations spent $413M. During the same cycle the ten largest unions in the country put together, spent around $153.5M. One can only hope that billionaire slush fund money isn’t finding its way into local elections via national organizations with local and/or regional affiliates as the Kochs, the Waltons, the Coors, The DeVos (Amway), and the other spoiled children and grandchildren of wealthy robber barons seek to remake the world in their gilded image. Sadly Joe, until the money in political parties and candidates is publicly funded the likes of Koch brothers from Wisconsin, Perry family in Texas, or the Soros family in New York will have undue influence on elections outside their own districts and states. The fact that the Koch’s and their different PAC’s could come in and flood a candidate in our county election with a million dollars and basically decide our election (over 90% of elections are won by the candidate that spends the most money). It is just wrong. Let me preface by saying I am a supporter of publicly funded elections. However, I feel compelled to post this interesting article by Harry Enton on Nate Silver’s 538 blog on some of the unintended consequences of publicly funding elections, mostly as a caveat emptor. There is not a perfect system. Public financing will be very effective for about a decade and after that there will be so many holes drilled into it we will be back on the corruption path once again. Those with money and a lust for power work relentlessly to get an upper hand in the law making and enforcement of those laws. Maybe in that decade elected representatives could actual govern in the interest of the people and get some good firewalls up that might hurt the profits of big business (like reinstate Glass Steagall) but protect the entire nation from the bad behavior of few businesses in a few industries. At the moment it is the other way around. When I have ever said all or nothing? Never! That is label for those who like to carry water for the Democrats put on those of us who hold them accountable for their participation in developing such a corrupt system. I to advocate for the inside/ out strategy it is just not the strategy those on the inside like. For the last time the system promotes corruption not individuals. I don’t care who you are if a person participates within the two parties they become corrupted, period. They will not see it as corruption but rather doing what has to be done to become elected. I find your lack of honesty on this issue frustrating as hell. To use a saying Jeff has thrown around lately. A continuation from the dragons breath. I have heard it from both sitting and former elected representatives how voting works and how the leadership of the parties play the game. I think you already know this but don’t want to admit it publicly. If a majority party ever brings a bill they “support” to the floor for a vote and it loses, that vote was strictly for campaigning purposes. Steve, I respect the work you do but have realized that you are promoting the same system that causes the problems that your are an advocate for their solutions. Somehow you believe by loyally supporting a political party with money and votes, the only thing the party ultimately cares about, meaningful reforms will take place. You will oppose this categorization but when you see what I am saying as “All or Nothing” this is the only interpretation I can take away from it. Continuously I have pointed to the candidates, work within the Democratic Party, volunteer hours with groups promoting policies, and so on to you and others but that isn’t enough for you. You want me to pretend that the Democratic Party is my friend when I oppose so much of the policies they support in 2014. I will say it one last time because it is like pounding my head against a brick wall. I support individual candidates and many of them are within the Democratic Party. What I oppose is the leadership of the Democratic Party and the interests they represent. I would encourage those interested to go read the story. Here is the problem I have with your position Ben: a bill falls one vote short of approval in a 2/3 situation when the Senate is down by 2 votes that would likely have voted for it, and you are spinning it as the “Democrats were worried that the disclosure law would snare some of their own”? Or you say that “Some how some way they always seem to fall short” and you spin that as corruption. Call me old fashioned but I don’t believe in saying people are involved in corruption unless there is some sort of evidence that corruption has occurred. 26 California Democratic Senators voted for this bill. Not one single Republican Senator voted for it. And somehow that is Democratic corruption? This is why I characterize your position as ‘all or nothing’. You demand victory and if you don’t get it even those who support you are somehow guilty of your failure. That is not only politically naive and unrealistic, it is downright immature. You may not have used the words ‘all or nothing’ but you are acting out the principle ‘all or nothing’. Either “I” win or even those who voted for me are crooks. What nonsense. Yes, and let us note the vote. Voting to strike down campaign donation limits were: Kennedy, Alito, Roberts, Thomas and Scalia. Voting to uphold limits were Breyer, Sotomayor, Ginsberg and Kagan. So those goddamn Supreme Court Justices appointed by Democratic Presidents just sold us down the river, right? I can’t see what difference Miller would make on the BOS. Have there been many close votes on controversial issues? From what I have seen, Lamphier is often the lone dissenter. The BOS needs more diversity, not less. Despite the slurs on your blog, this article is drawing a ton of traffic. I’m afraid the political “cat is out of the bag.” It must pain you. Anyway, now we’ve got a real horse race in District 3. This race is going to be decided by several hundreds of “decline to state” voters and “people in the middle,” not the extremists. Will the tea party’s involvement sink the Miller campaign? Dunno but a lot of people who read this story are linking to this one, according to my stats: http://fivethirtyeight.com/features/the-wild-conservative-west/ In short, a disconnect between the people who govern and their constituents, or “the conservatism is out of step with the people it governs.” The hard right doesn’t know when to bow out — on local or national levels. I’m going to let this post “ride” for a few days and take a break from the blogosphere. Maybe it will be picked up by other media. After all, it’s news — in fact, the most significant development in this campaign so far. In the meantime, I’ve got real work to do. You’ve already tipped your hand in this campaign as a cash contributor and booster. Are you being compensated (cash or “trade”) to blog too? You were awfully fast with your misguided commentary this afternoon. I’m just watching it. (And to be honest, I was surprised at this development.) Big difference. Greg Diaz redux? I’d be sweating it from your end. You’re reputation as a small-town “political operative” is on the line. Happy trails, Barry. Barry Pruett is sliming me again on his blog, allowing an “anonymous” post to stand that I am a member of the Nevada County Democratic Party Facebook page, suggesting partisanship. For the record, I also am a member of the Nevada County Tea Party Facebook page. But Pruett and his “anonymous” troll poster didn’t mention that. That’s OK Jeff, I once received a piece of used toilet paper inscribed with “Burn this commie” in the mail for an Other Voices column I wrote many years ago about the 30 something Supreme Court decisions upholding flag burning as free speech after a group of young people torched a flag at the Constitution Day Parade in protest of their treatment by Nevada City Police. Does the goat head left on Democrat HQ in Grass Valley on election night 2008 count? All candidates should be required to write and post once every three days for 30 days before the election, about why they are running, what they expect to accomplish if elected, and how they will go about doing it. There should be a one person, one on-line vote, on the fourth day, and the numbers made public, and a spot be available for said online voters to comment on why. None of the above should always be a choice, but only with a 5 sentence minimum essay. Plus disclose any contributions relieved each day, after initial disclosure of late (ha ha) contributions. Interesting piece, Jeff. The way your blog has evolved since the last time I visited is reminiscent of the journalism style of the Yellow Kid, an 1895 cartoon in the New York World. In those days, it was the New York World, Pulitzer’s newspaper, and Hearst’s New York Journal vying for readership by adding more sensationalized stories and increasing the use of drawings and cartoons (your version is video). The blog post heading, “Tea Party PAC” is just the type of article title Pulitzer and Hearst would have used, you know, just enough fact and a bit of stretch. After all calling it the Americans for Good Government PAC, or AGG PAC for short, just doesn’t have the same ring, does it? Although, you may be correct in the AGG PAC having a number of Tea Party members, however the Tea Party organization itself nor a majority of Tea Party members are involved in the AGG PAC. Tea Party members I know take quite seriously the three tenets of their organization, Constitutionally Limited Government, Fiscal Responsibility, and Free Markets. That’s pretty simple. I don’t know of any political candidate who has ever been endorsed by the Tea Party as an organization. As Mark Meckler has said time and time again, “We don’t endorse candidates. Let them endorse us.” And, as Mahatma Gandhi said “First they ignore you, then they ridicule you, then they fight you, and then you win.” I remember the ignore and ridicule stages well, and the fight stage is proving interesting. Again, thanks for the piece. Your argument about a “nonpartisan” tea party continues to ring hollow for the vast majority of Americans because what you do and what you say are two different things. Jeff, I’ve never seen you do a bit of a stretch in your columns. Hmmmm…. Any contributions to Dan Miller by Russell Jeter, the real estate developer proposing a mall at Dorsey Drive? It would be nice to have Dan answer whether he knows who/where all the donations to this PAC are coming from. First it would be nice to see the local mainstream media (The Union, KNCO etc.) just write about the issues to begin with. The community has outgrown its newspaper, and the internet is changing how we communicate. This transition is long overdue around here, where the local newspaper has been a real bottleneck of communications.